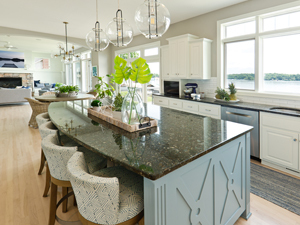 Granite is a popular countertop material because it is durable, resistant to scratches, chips, and heat, and relatively easy to maintain compared to other types of natural stone. However, some stones that are definitely not granite are being sold as if they were. Here are some ways you may be able to tell. Vinyl countertop films and laminates are often printed with a granite pattern, and quartz or solid surfaces are created to look like granite. These materials cannot duplicate the true appearance and durability of a natural granite slab. Perhaps you purchased a home with stone countertops already installed. An inspection of the color, pattern, and the appearance of the seams, as well as the porosity, may help you determine whether the material is granite. If there is very little variation in the color and pattern, or if there are no natural imperfections, you may be looking at something other than true granite. If you see repeated patterns, then this is a strong indication of a man-made material. Inspect the seams in the countertop. You should be able to see a change in the pattern. If you don’t, then the material is most likely not granite. You can check the porosity of material by putting a few drops of water on the surface. If it is granite, it should darken as the water is absorbed, unless, of course, the granite has been sealed. There are a couple of observations you can make in a fabricator slab yard that may help you determine whether a slab is genuine granite. First, bring a small hammer or piece of metal with you. Gently tap the back end of the slab. If it is true natural stone, it will produce a ringing sound. Engineered stone contains synthetic resins and a tap on it will sound dull in comparison. Disclaimer: The only problem with this method is that the slab may be a real natural stone that is not actually granite. It may contain acid-sensitive minerals that will etch like marble. Second, pay attention to price. Real, quality granite is rarely ever inexpensive. If the cost per square foot is suspiciously lower than other dealers in your area, the material probably isn’t granite. And if it is granite, it probably isn’t a very good quality granite. You get what you pay for. It can be hard to tell but there are some clues. If it does not scratch with a knife and it doesn’t etch with a mild acid it could be granite. However, there are other stones that react the same, like quartzite, for example. Any stone restoration contractor worth their weight in salt, or should I say, marble dust, should be able to tell the difference. If you already have stone tops that are not holding up the way granite should or that prove to be something other than granite, you may not need to replace the stone. We can resolve a host of natural stone countertop problems and restore your countertops to a like new condition, as well as provide cost-effective protective solutions to keep them looking great.